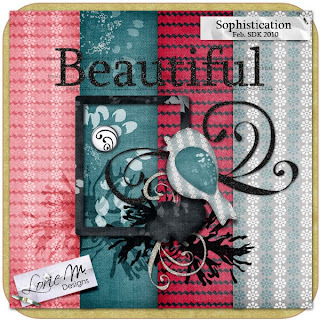 Gorgeous, fun, bright colours with terrific elements to add to your pages. Here is a bit of inspriation to get you on your way scrapping! 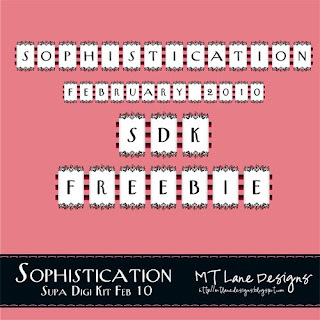 Here is the very last kit for February's Supa Digi Kits...get it now before it's gone at the end of the week! Black and White Sophistication with a touch of colour. 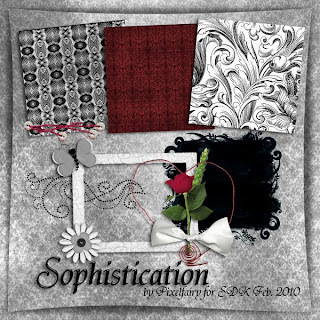 Think STYLE... think CLASS... these kits will be perfect for those Romantic, Chick or Elegant layouts! 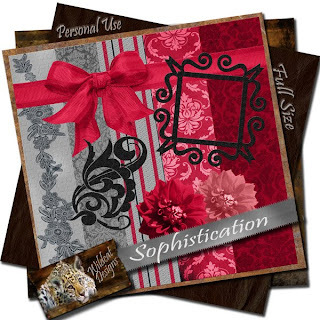 and a TOOT for our very own LorieM...Lorie was featured in the Scrapbooking Memories Vol12 Iss2...YAY and congrats Lorie! On SALE NOW 40% off for the first week only! Day 5 - 6hrs traveling time: As luck would have it my estimated time for returning home was way out. Instead of the two days of travel it will only take approx 6hrs, don't ask me how I got this wrong...lol. We are both very tried but happy to drive straight home. While there are lots more places to visit, we know that we can come back anytime. We are both very excited to sit down and have a good look at the photos, I dare say there maybe a bit of playing with them too :). I certainly won't mind sleeping in my own bed tonight...hahaha. I am always amazed whenever we have traveled at the diversity of this beautiful country we are lucky enough to call home. It has been a really great trip and a lot of fun too, I'll leave you with one last photo. 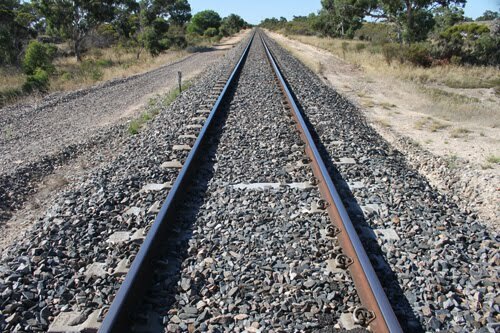 Day 4 - 2hrs 30mins traveling: Today is the DAY...the whole purpose for this trip was to visit the Tailem Bend Pioneer Village. The day has dawned hot and cloudless so our hats and sunscreen will get a work out. We are still hugging the coastline for most of the way, not complaining though as the ocean is so pretty to look at. 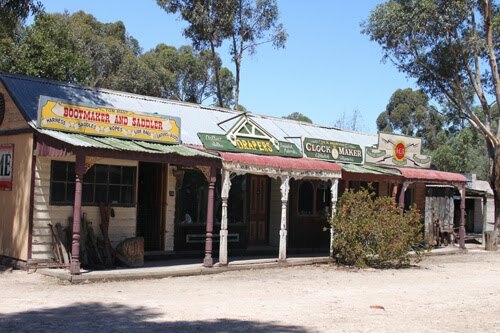 Around lunchtime we arrived at the Old Tailem Town Pioneer Village and didn't leave until 4.30pm. What a place! It's a recreation of the good old days in Australia with many of the buildings and relics being donated. Over 100 buildings spread out over 12 streets, we had such a great time just wandering and photographing as we had the place to ourselves for most of the day. It was another long day but well worth it, Hubby is very happy with the photographs he took :) Murry Bridge is our place of rest for the night just a short distance up the road. Day 3 - 5hrs 30mins traveling: The day dawned hot with a beautiful blue, cloudless sky :) On the itinerary today is a trip to Portland, then across the Victorian border into South Australian - Mt Gambier is our first stop here, stopping for the night in Kingston SE. After a delicious cooked breakfast in Warrnambool, we wandered across the road to a huge Spotlight Store (craft and dress material). I was very good and didn't buy too much...hehehe...I did pick up a couple of cake plates for DD and DD-in-law for Christmas, at 40% off these were a bargain. Even after a not too bad sleep, we were both still a bit tried and very sore from yesterday's day tripping. 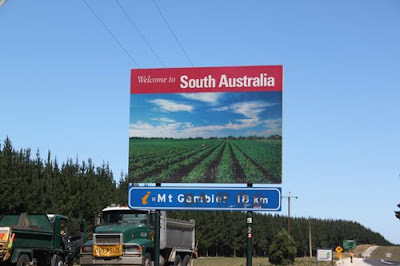 This helped us to decide to skip Portland and just head straight to Mt Gambier. Lunch was had in a little coffee shop that was part of the Mt Gambier Library, then a trip to Target was needed to get ourselves hats and sunscreen. 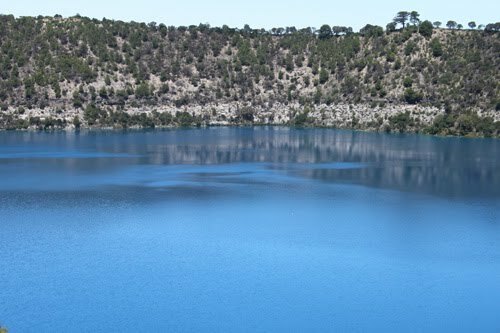 Mt Gambier is famous for it's Blue Crater Lake as you can see from the photo. There were no good places to take a photograph that really showed the blue of the lake but it was awesome! Back in the car and onto Kingston SE, a little coastal town. 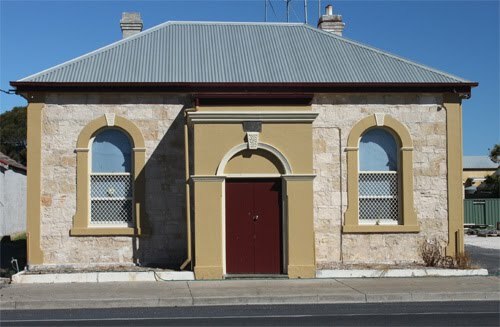 Part of South Australia's charm is the sandstone houses made in a Victorian style. Combine that with lovely people, a relaxed atmosphere and you have a delightful place to visit. Our day finished with fish and chips eaten beside the beach and watching the sun go down. Day Two - Monday 2 hrs 40 mins traveling: Well the weather is overcast but at least the rain has stopped, fingers crossed the weather improves the further west we go. First stop Cape Otway the southern most point of Victoria to visit the Cape Otway Lighthouse. The Lighthouse was established in 1846 and decommissioned in 1995, We spent so much time here it was fabulous. As luck would have it the weather was beautiful, while it was very windy the sun was out. Hmmm...must remember to pack the sunscreen next time, yes we both got sunburn...hahahahaha! Because we spent so much time at Cape Otway we weren't able to visit any of the Falls in the area :( We still had the Twelve Apostles to visit and a Maritime Village. What can I say about the Twelve Apostles, the coast line is just stunning. As we were there late in the afternoon, the sun was in the wrong position to take any good photos of the Twelve Apostles themselves but we did get the odd shot of the cliffs, beach and other rock formations. My photo just don't do these justice, I can finally say I have been on the Great Ocean Road and visited the Twelve Apostles. Thankfully the Maritime Village tour and Laser Light Show I had booked for dinner was cancelled. We arrived at our destination Warrnambool for the night by 5.45pm very tired, sun burnt and a bit sore from all the walking, so missing out on the dinner and show was ok...hehehe. The motel room has a spa, oh man I can't wait to climb into that tub and just soak. Weather is looking good for tomorrow...woot, woot! Hubby and I are off on one of our little photography jaunts. 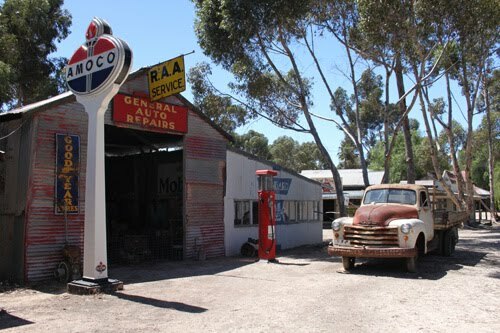 We will be traveling over six days, with the main destination of Tailem Bends in mind. Along the way we hope to stop at a couple of light houses that dot the southern Australian coast and pay a visit to several waterfalls in and around these areas. Day One - Sunday 5 hrs traveling: the day started off great! We said happy Valentines Day, exchanged hugs, kisses and presents...hehehe. Followed this up with a cooked breakfast of Bacon and Eggs, packed the car and set off. Unfotunately we only got 15mins down the road and had to go back, I had forgotten to pack the mobile internet key...DOH! OK, we set off again and made it all the way this time...lol. First stop was Point Danger lookout - Torquay, a little beach town. From the lookout we were able to walk to the beach, not much sand but lots and lots of sandstone looking rocks. Next stop was Split Point Lighthouse - Aireys Inlet, not much to see there and the weather has turned for the worst. 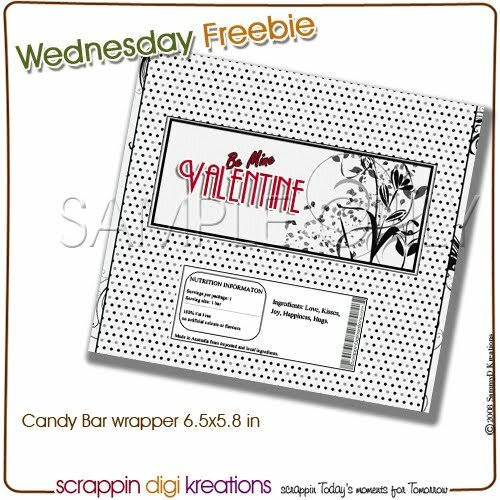 Print on 8x10 or A4 paper, cut out and wrap around your favorite chocolate bar. Today's Kreative Star is our very own Meryem...YAY! 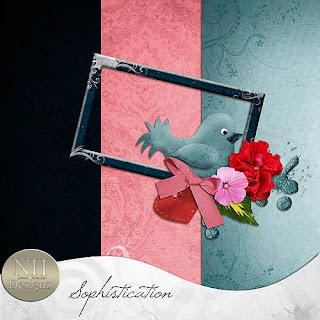 From the soft colours that compliment the gorgeous photos, to the delightful element cluster this layout is a winner. See more of Gwacie's great layouts HERE! I love the shelf look...a neat, balanced layout and a great way to show multiple pictures.